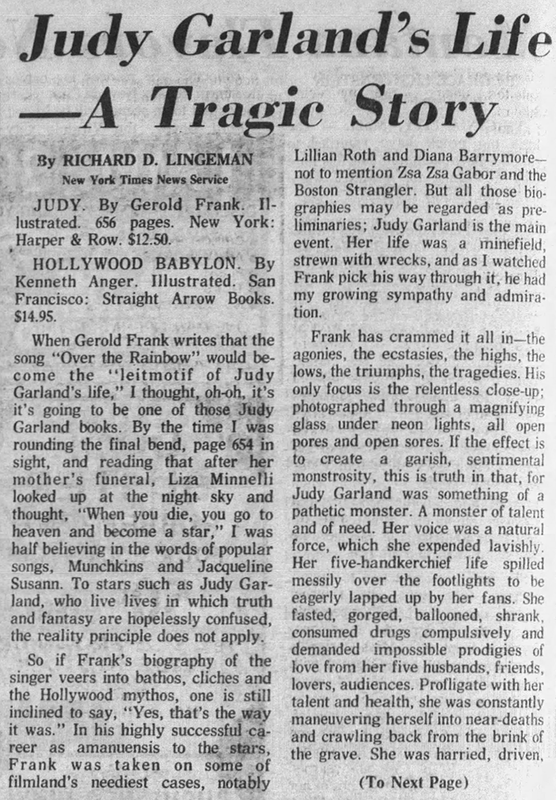 July 13, 1936: Judy made the society page of the Los Angeles Times. 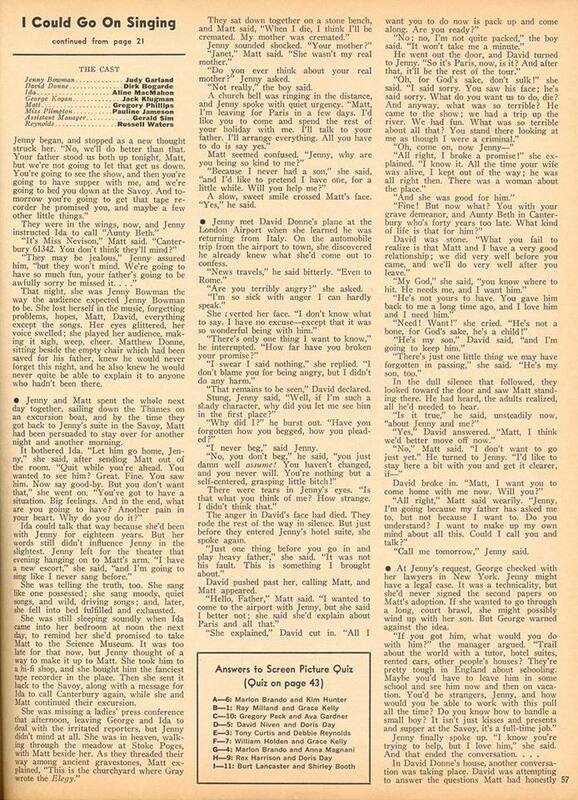 She’s listed as one of the featured performers at a party given by Miss Joine Alderman and Tib Weaver in favor of Grand Dame Leafie Sloan-Orcutt. Sloan-Orcutt had been a fixture of Los Angeles for decades and as the president of the Board of Park Commissioners, she had been responsible for the look of LA’s parks including fountains, bandstands, lakes, and swimming pools. She also secured a substantial pay raise for the park workers, more holidays, and even first aid training. She was quite a woman! It’s unclear how Judy came to be a part of the show. Perhaps it was due to MGM studio head L.B. Mayer’s connections. 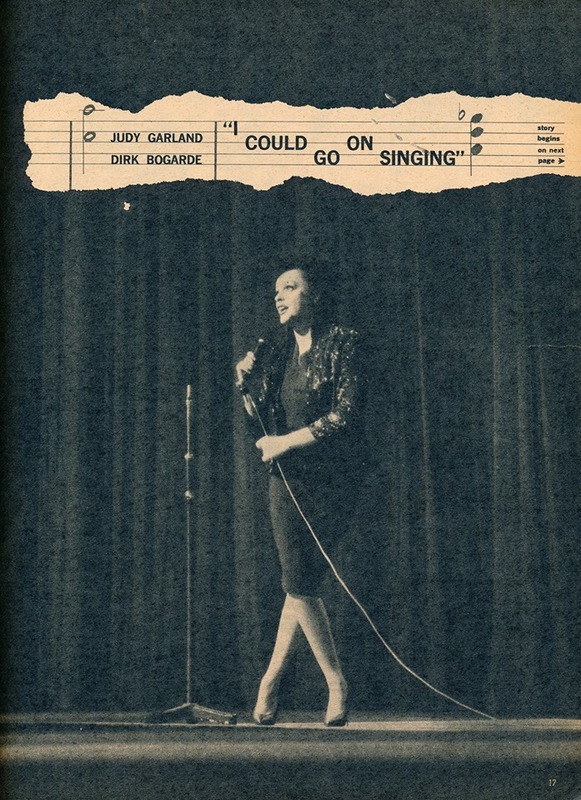 There’s no record of what Judy sang. 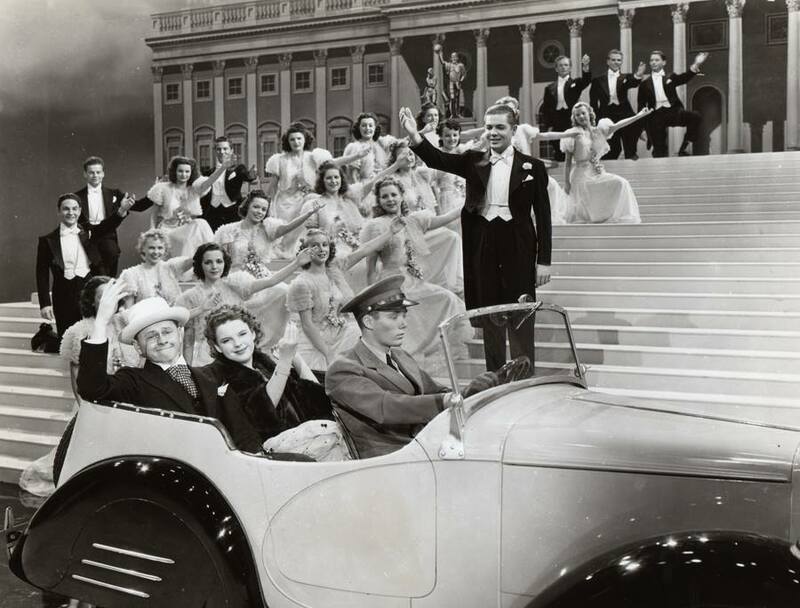 July 13, 1939: Filming began on the “Finale” for Babes In Arms on the “Interior Madox Theatre” set which was shot on MGM’s soundstages 5 & 6. 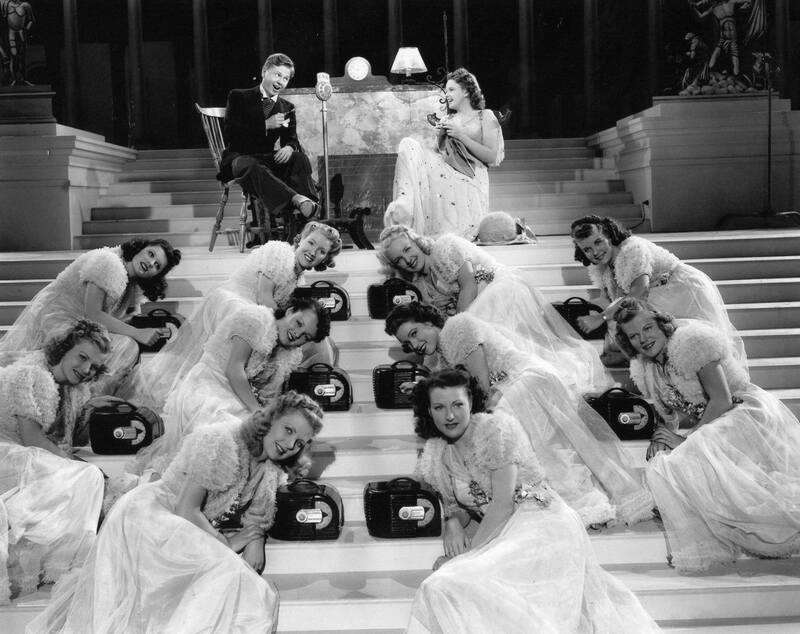 Soundstages 5 & 6 were connected, containing the only permanent indoor set on the lot, the “theatre set” originally built for 1925’s Pretty Ladies. Stage 5 contained the seats and balconies while Stage 6 contained the proscenium-arched raised stage. 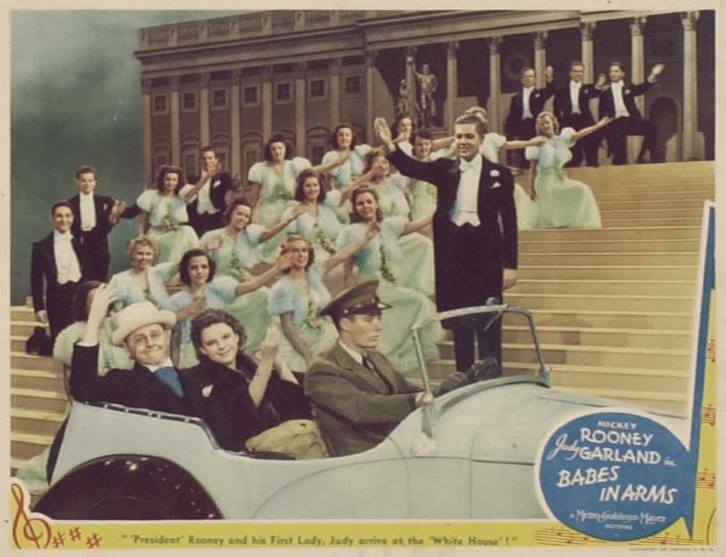 Any film with a big theatre opening or other big theatre scenes was shot on these stages, including several of Judy’s films. 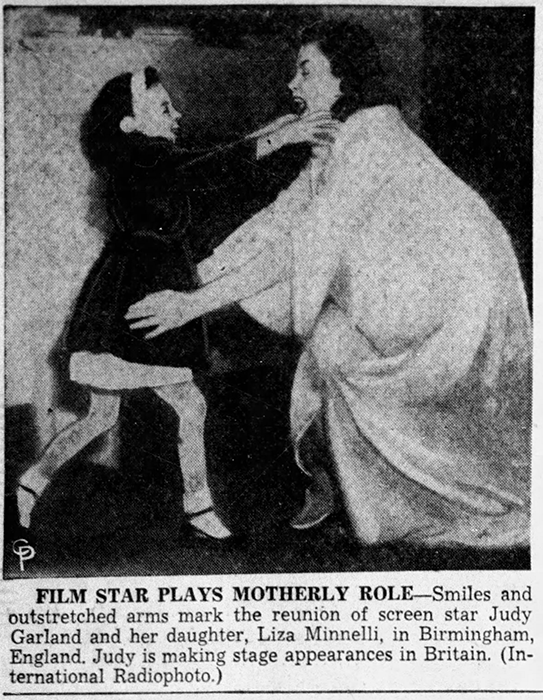 One of its last uses was for the 1977 film New York, New York starring Judy’s daughter, Liza Minnelli. 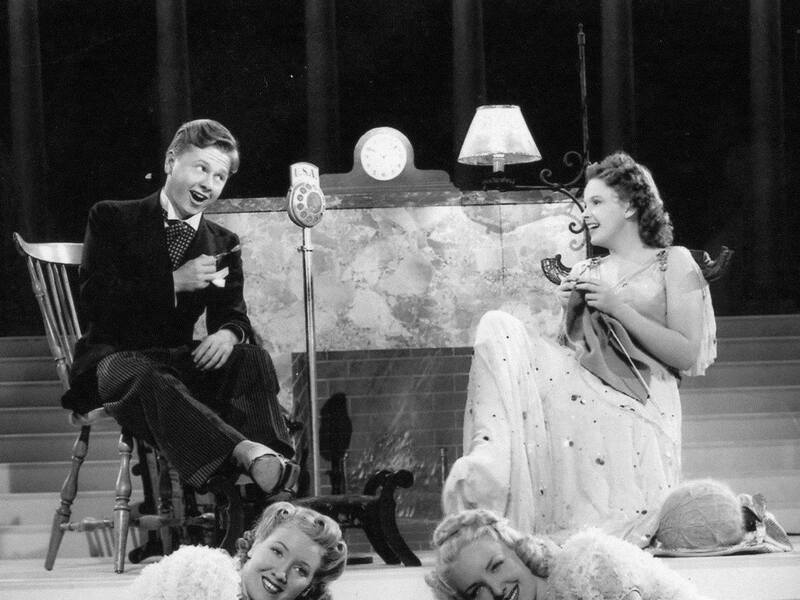 July 13, 1940: A long afternoon, evening for Judy, Mickey Rooney, and the rest of the cast of Strike Up The Band. Filming on the “Finale” sequence on the “Interior Radio Theatre” set lasted from 1 p.m. to 11:33 p.m. Luckily there was no call for the next day so luckily they didn’t have to get up early. That we know of. 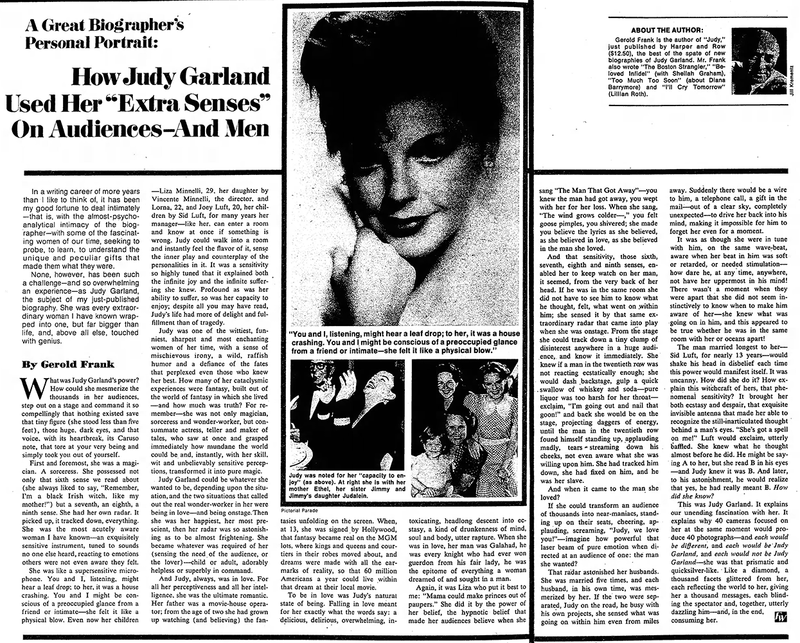 July 13, 1944: Judy had a short rehearsal of “The Interview,” a.k.a. “A Great Lady Gives An Interview,” a.k.a. “Madame Crematante” for Ziegfeld Follies. 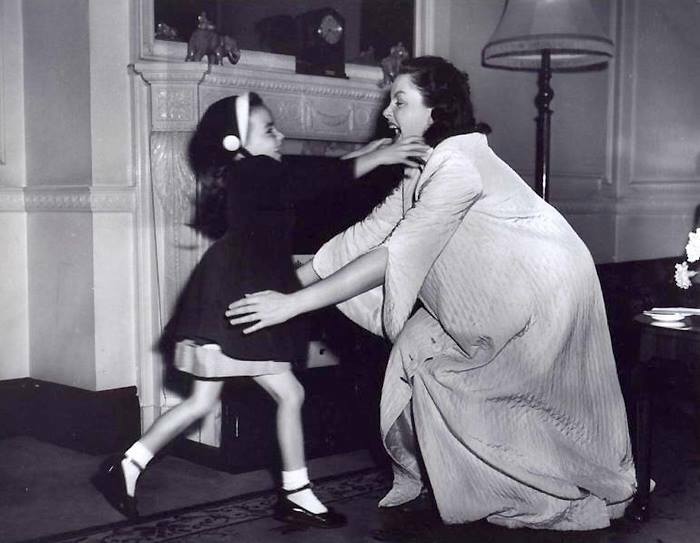 Time called: 4 p.m.; dismissed: 6 p.m.
July 13, 1951: Judy was on the second day of a week-long engagement at the Hippodrome in Birmingham, England, when she received a surprise visit from daughter Liza. 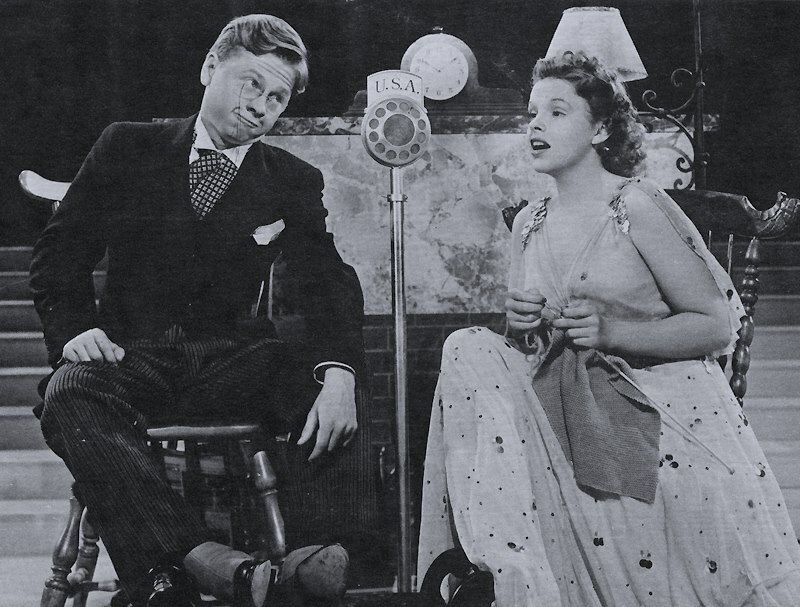 July 13, 1954: A Star Is Born filming continued with more shooting of the “Black Bottom” number on the “Interior Stage” and “Interior Backstage” sets, plus the “Rehearsal” sequence” on the “Exterior Stage Door and Sign” set. Time started: 6 p.m.; finished: 2 a.m. 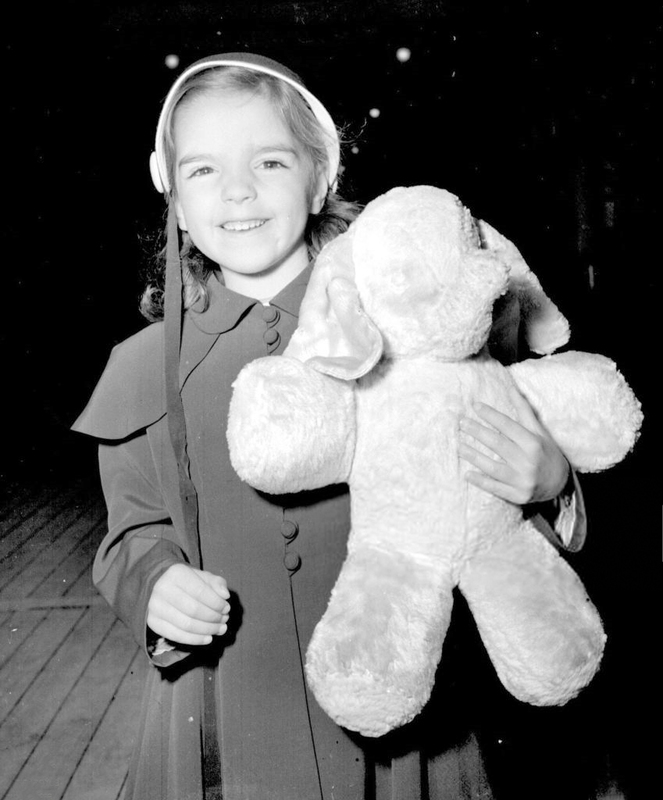 The filming schedule had been moved to starting later in the days/evenings to accommodate Judy’s body clock. 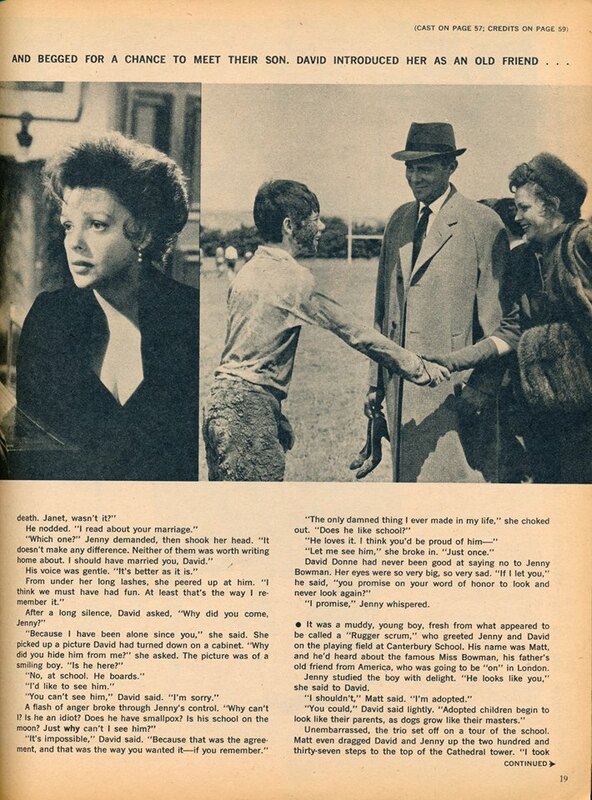 July 13, 1962: Judy completed filming on what would be her last film, “I Could Go On Singing.” The film premiered in London on March 6, 1963. 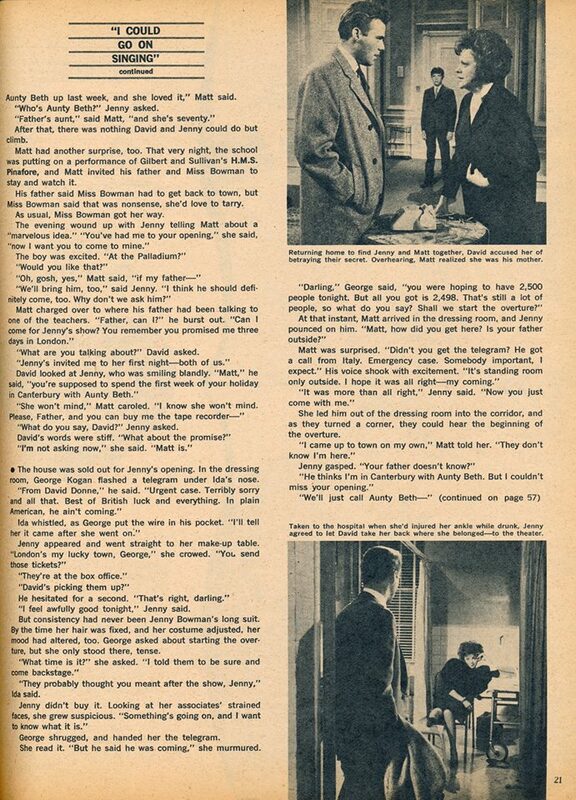 Scans of the May 1963 “Screen Stories” article provided by Kim Lundgreen. Thanks, Kim! 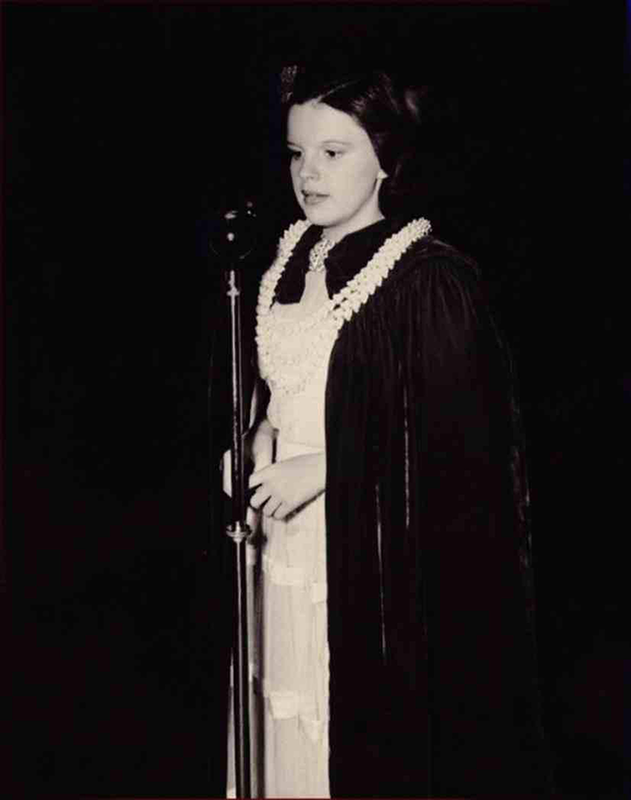 July 13, 1967: This photo was taken of Judy on her third night of five-night run at the Camden County Music Fair in Camden, New Jersey. 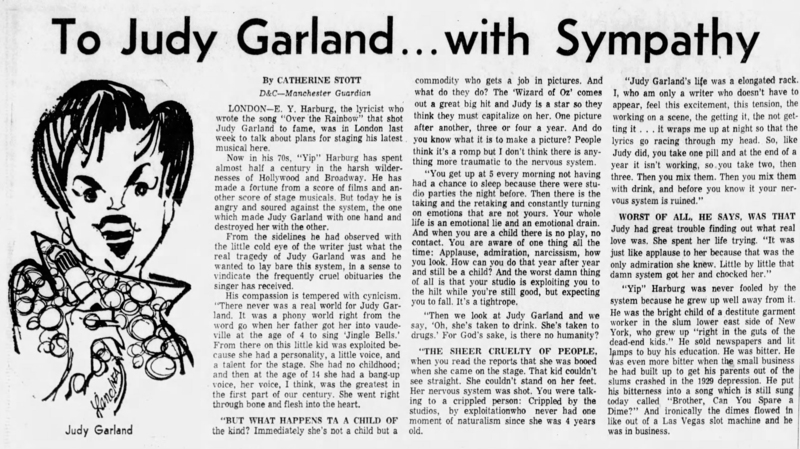 July 13, 1969: Judy’s untimely passing was still news. There were many articles that covered many aspects of her life and career. 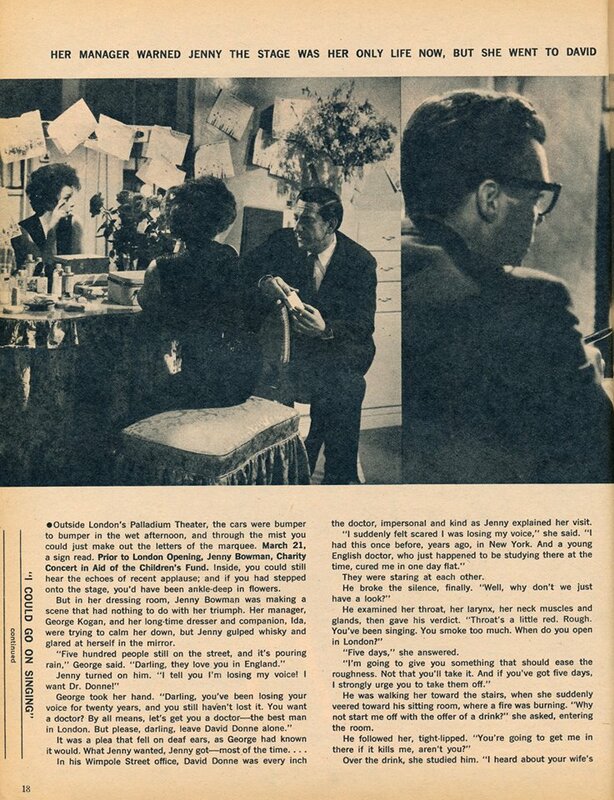 Here is one with a really great caricature that gives “Over the Rainbow” lyricist E. Y. Harburg’s take. 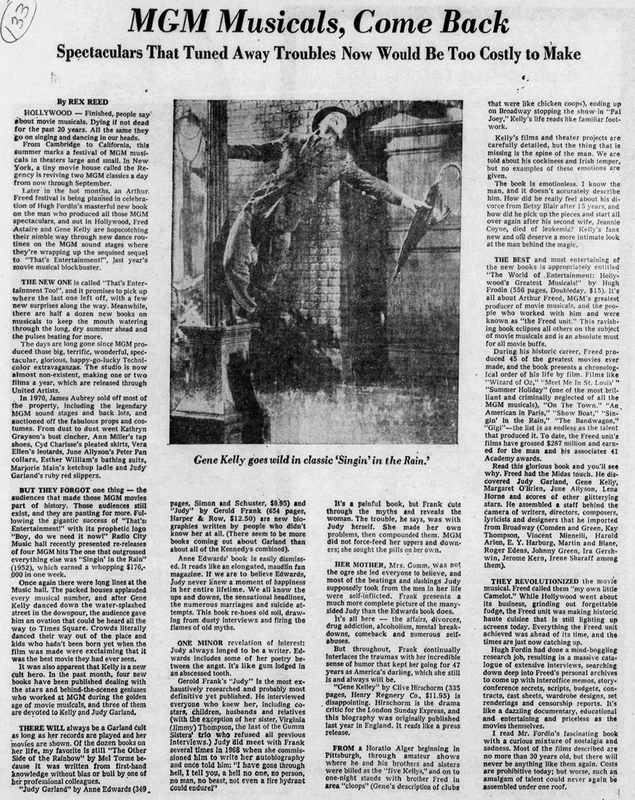 July 13, 1975: Nostalgia for Old Hollywood was big. In 1974 That’s Entertainment! surprised everyone when it became a big hit. 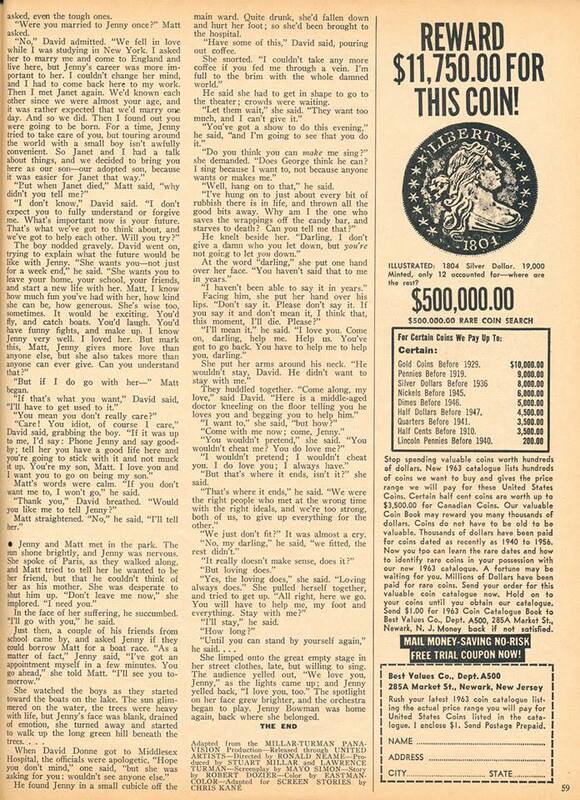 The MGM auction of 1970 was still stinging fans. 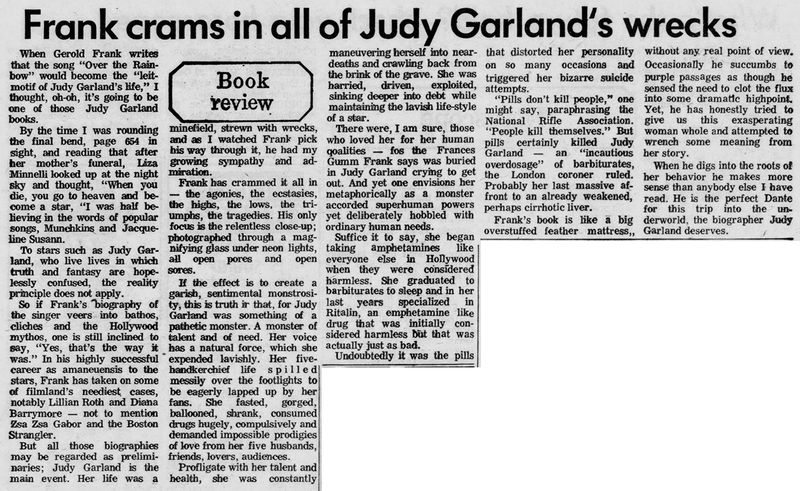 Mel Torme’s Garland book had already come out, as had the one from Mickey Deans, but the summer of 1975 gave us the first big serious biography about Judy, “Judy” by Gerold Frank. 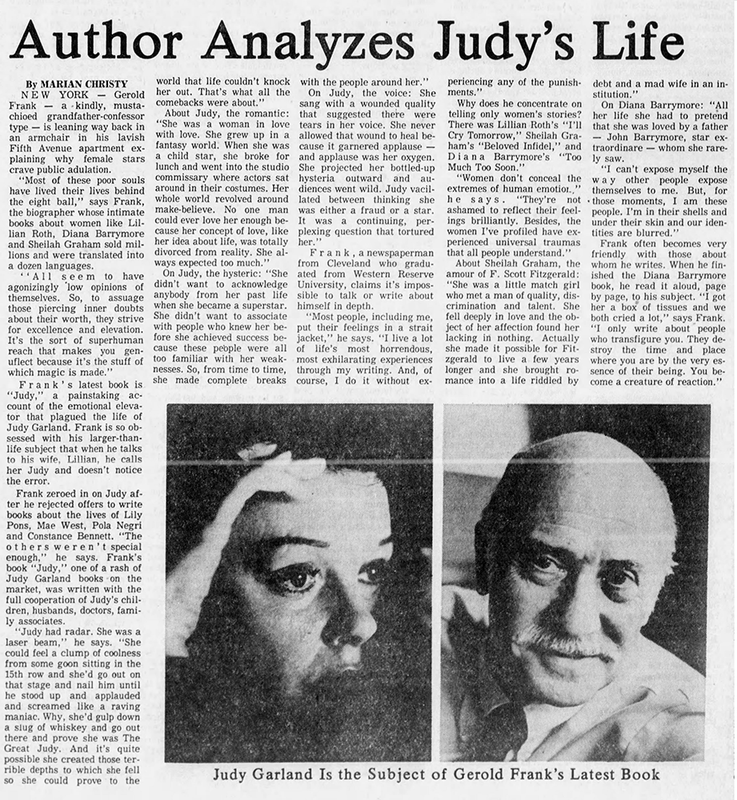 It’s still the only biography written with the full cooperation of Judy’s family. 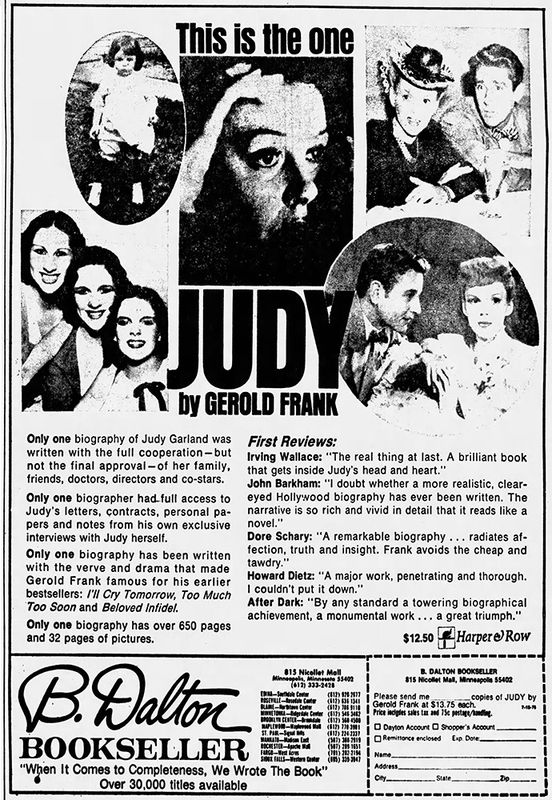 Anne Edwards’ biography about Judy, “Judy Garland,” had been published before the Frank book, but it was the Frank book that got most of the attention. 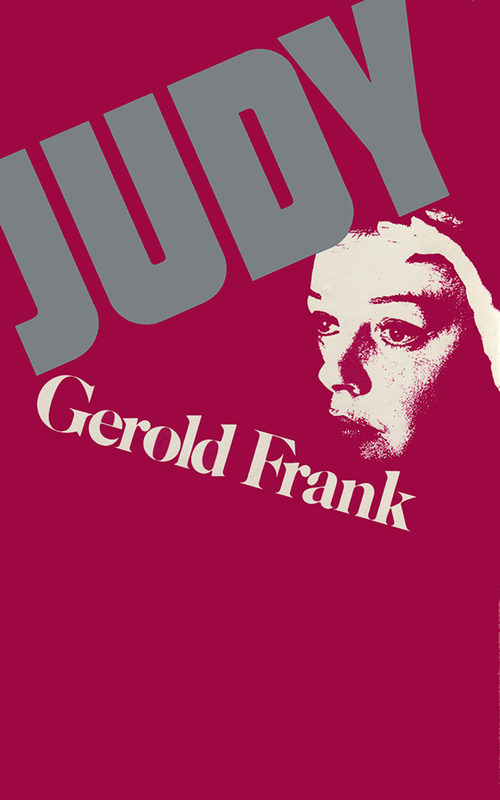 The Frank book was so huge that as late as 2001 the ABC miniseries “Life With Judy Garland” used a few passages, quoting verbatim, in the teleplay. 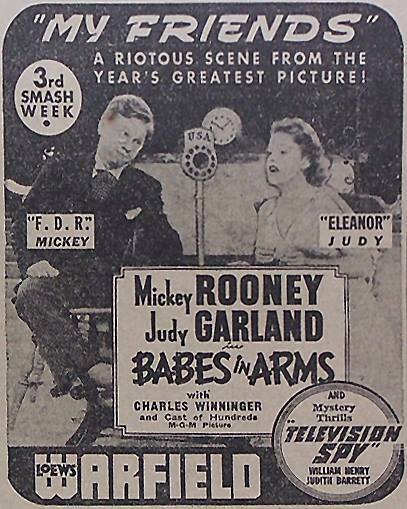 Above is another article published on this day which is about the new wave of nostalgia including Hugh Fordin’s fantastic new book about the Freed Unit, “The World of Entertainment: Hollywood’s Greatest Musicals!” (later republished as “The Movie’s Greatest Musicals – Produced in Hollywood USA by the Arthur Freed Unit” and then “MGM’S Greatest Greatest Musicals – The Arthur Freed Unit”).